Today, fifteen Attorneys General from across the country announced that they are petitioning the Environmental Protection Agency (EPA) to drastically increase the amount of transparency required from the American asbestos industry. 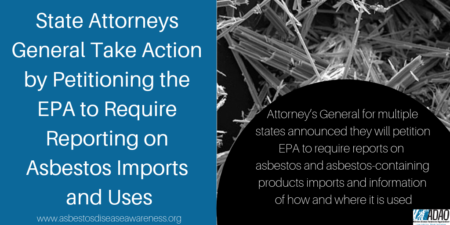 ADAO applauds the leadership of the Attorneys General and their recognition that – by leaving the country in the dark on asbestos – the EPA is not doing enough to protect Americans from a known carcinogen. If accepted, the petition will provide a wealth of information previously denied to the American people. Commercial users of asbestos will be required to inform the EPA of how and where the mineral is being utilized. Imports of both the fiber itself and products that contain it – piping, insulation, baby powder, etc. – will need to be reported as well. While the EPA is currently empowered to require importers and users of toxic substances to report their activities, they have neglected to use this authority to properly regulate asbestos. The multi-state petition, filed on Jan. 31 under the Toxic Substances Control Act (TSCA), was co-led by Massachusetts AG Maura Healey and California AG Xavier Becerra and joined by the attorneys general of Connecticut, Hawaii, Maryland, Maine, Minnesota, New Jersey, New York, Oregon, Pennsylvania, Rhode Island, Vermont, Washington, as well as the District of Columbia. Ineffective reporting requirements are a big part of the public health crisis surrounding asbestos. Put simply, the EPA cannot exercise proper oversight of an industry that it knows so little about. Nearly 40,000 Americans die from preventable asbestos-caused diseases every year, and the EPA cannot reasonably expect to bring that number down until it has the information needed to do so: where is this deadly mineral being used in our country? In what quantity is it being imported? What consumer products does it end up in? If we’d like to begin regulating the Chlor-Alkali industry, for example, which imports and uses hundreds of tons of raw asbestos every year, we must know more about their activities. Last September, ADAO submitted its own Right to Know Petition to the EPA. Filed under Section 21 of TSCA, the petition pressured the EPA to begin collecting this information. The petition also asked the EPA to make this information public, so that American workers and families would know where and how asbestos is being used in their communities. Despite the obvious benefits of reporting this information to government regulators, the EPA denied our petition. Undeterred by this development, ADAO has responded with a rebuttal of the EPA’s denial, asking the Agency to reconsider the petition as it reviews the more recent one submitted by the state AG’s. ADAO is encouraged by these state petitions and the public should be too. Furthermore, we feel the state petition validates not only our Right to Know Petition, but also our belief that everyone has a right to know when they are put needlessly at risk by toxic chemicals and the companies that use them. We are more confident than ever that our petition was wrongly denied by the EPA. We hope the EPA will reverse its position, but you can be certain that we will be looking hard at legal action moving forward.